Congratulations to Megan Mullin who designed this year’s t-shirt for Natural High Day. Megan is currently a fifth grader at Smackover Elementary School. Natural High Day is an annual event for Smackover Elementary School students. Each year, students participate in a contest to design the t-shirts given to students. To see all of the previous t-shirt winners, come to the elementary school and walk down the primary hall where the shirts are displayed. 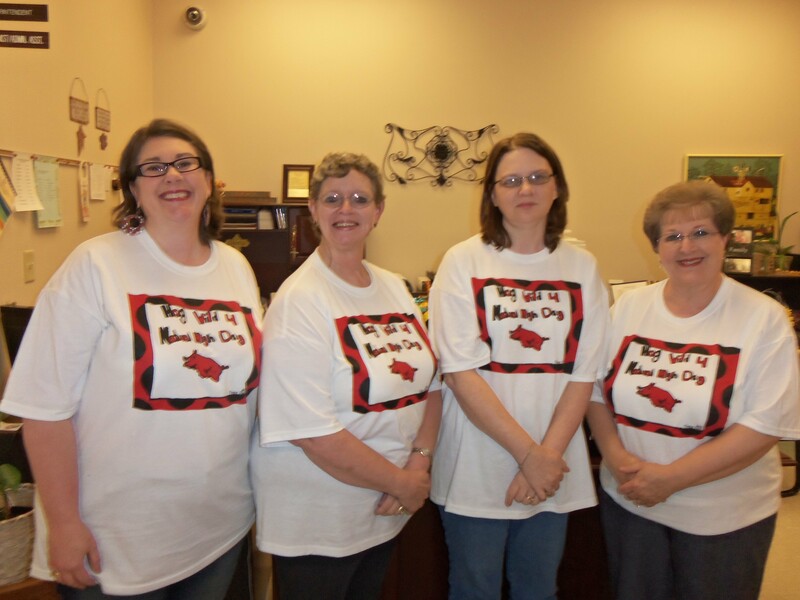 Some of the Smackover School District Central Office staff modeled this year’s winning t-shirt. Pictured below are Brooke Mendenhall, assistant bookkeeper; Lori Willis, business manager; Valerie Elkins, bookkeeper; and Gloria Watson, administrative assistant. Posted in Buckaroo News on April 30, 2012 by The Buckaroo Blog. Posted in Buckaroo News on April 27, 2012 by The Buckaroo Blog. If any of these words sound interesting to you, then the Business Finance Program of Study might just be the thing for you. In the 2013-14 school, students will also be able to enroll in Computerized Accounting II. If you are interested in enrolling in any of these courses for the upcoming school year, please contact Mrs. Cheryl Corley. Posted in Buckaroo News on April 26, 2012 by The Buckaroo Blog. To celebrate Arkansas Children’s Week, the three and four year olds from Smackover Preschool participated in a parade in downtown Smackover. For some of the children, this occasion was also their first opportunity to ride a school bus! Arkansas Children’s Week continues through Friday, April 27. Posted in Buckaroo News on April 25, 2012 by The Buckaroo Blog. Have you ever wanted to be in the band, but never took Beginning Band in 7th grade? Mr. Riley, next year’s band director, is going to teach a Beginning Band class for anyone who wants to be in the band but never had the beginning band course. This course will count towards high school graduation and can be used to satisfy the fine arts requirement for graduation. If you would like to enroll in the course, sign the list in the high school office or contact Mrs. Cheryl Corley. The annual Miss Derrick Pageant was held on Saturday, April 21st. Congratulations to the Miss Derrick winners! Posted in Buckaroo News on April 24, 2012 by The Buckaroo Blog. Smackover Preschool will celebrate Arkansas Children’s Week all week! The theme for this year’s Arkansas Children’s Week is Meet Me Under the Storytelling Tree. You are invited to come read a story, or better yet, tell a favorite story to your child’s preschool class. Our annual Children’s Week Parade is going to be Wednesday, April 25th at 9:30 am. Please come join us as we walk downtown and celebrate our children. All 3-4 year old classes and Ms. Tena’s toddler class will participate in the parade. You may bring your child’s bike or tricycle. We will meet you at the First Baptist Church back parking lot on 8th Street. Please check with your child’s preschool teacher for any other activities they have planned for their class. Posted in Buckaroo News on April 23, 2012 by The Buckaroo Blog.